~ Thriller Thursday ~ First Installment ~ Accident or Murder? 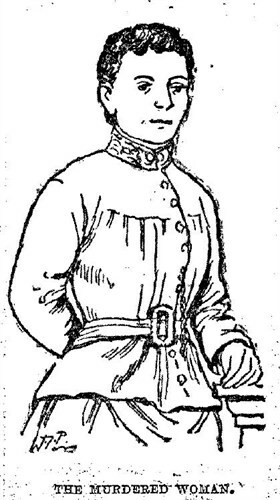 Rhoda Ann Titcombe. John Carter’s third wife. It was 1889 and John Carter once again found himself the single father of now seven children– 6 from his first marriage and a son, John Nelson Carter, from his second. He continued to spread the tale of his wife’s desertion; Her foray with another man, the so called “chap from Swindon”. He continued to carouse the local pubs, his love or need for drink sustained. 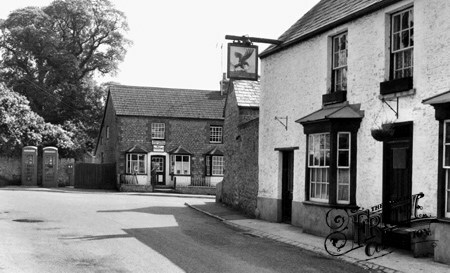 He had moved the family to his home town of Watchfield from Longcot and now frequented the “Eagle Inn”, an establishment owned by Joseph Pocock, the same man who had run John’s favourite Longcot haunt, the “King and Queen”. 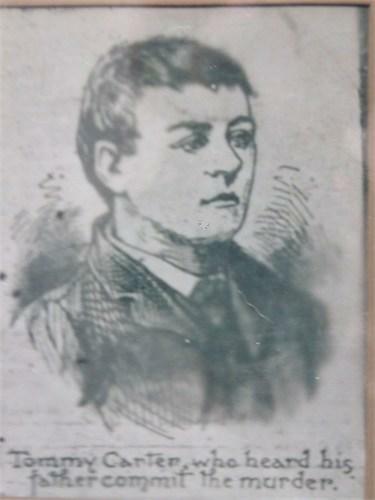 It was in 1893 at the “Eagle Inn” that John Carter announced in a drunken state that he was to marry bar maid Rhoda Ann Titcombe–once again a member of the enterprising Mr. Pocock’s staff. Questioned regarding how he could possibly marry when his previous wife was alive and living in Swindon, John cajoled and offered them five pounds to find his wife “Dead or Alive”. In April of that year John and Rhoda were wed, John listed as a “widower” on the registry. It seems the short marriage may have been a bumpy one! John was quite obviously a jealous man with a hot temper. Two months after they were wed John was heard at a local feast saying that Rhoda was to dance with no other man. “Should she want another man I will be the death of her”, a witness had later recalled him saying. This was to be a foreshadowing of the events to come! July 20th 1893, late into the night John’s 9 year old son Thomas Carter (my Great-Grandfather), was roused in the night by dreadful noise, “a banging from the next room”, his step-mother’s cry ” Lord have mercy upon us”, and then from the stairs a “knock, knock, knock”, much heavier than anyone’s walking. The following morning Thomas was told his step-mother had gone to East leach and that he was to go fetch the cows. John was to be busy in the smithy attached to the cottage all day and Thomas was warned off going near the forge and the wash house. The friendly walk John and Rhoda took the day of July 20th was the last neighbours saw Rhoda alive and well. And when Rhoda’s mother came in search of her the next day, John informed her that her daughter had gone to her confined sister in Eastleach. Her mother left filled with suspicions and doubt! Later that day, John sent his son Thomas on another errand. He wanted a quarter hundredweight of coal and had sent Thomas to a local farmer and dealer to fetch it. Soon after, a thick and noxious smoke coming from the Carter wash house disturbed a curious neighbour, Ann Butler, from across the lane. Over she wandered, it was a hot evening and there seemed no reasonable explanation for the billowing smoke of a substantial fire. Pushing open the door, Ann Butler, peered in to see a large tub surrounded by kindling and coal, but she was suddenly pushed out of the wash house by John, He abruptly slammed and latched the door behind them. |i’m burning rubbish.” he explained but Mrs. Butler was hardly convinced. John maintained that Rhoda had run off to her sister’s in East Leach when he was bombarded questioning relations and two days later the local police constable Charles Sparkes was informed that Rhoda Titcombe had gone missing, her husband suspected. Cst. Sparkes set out to investigate this mysterious disappearance. Another disappearance, another wife run off! Was John Carter a rough, but pathetic “Dear John” always being deserted because of his hot headed disposition? Or was something more sinister afoot? Certainly most of Watchfield believed something was most definitely amiss!